Florida's pioneer Classical Guitar nonprofit organization, the Miami Classical Guitar Society initiated and developed a guitar movement in Miami since 1987, establishing South Florida as a hub of international importance for the instrument. Dedicated to enriching our culture, MCGS promotes art, awareness, and education of Classical Guitar through world-class performance, innovation, and vision. The MCGS has created and organized over 200 concerts featuring world-renowned guitarists and local talent, founded Miami's International Guitar Festival & Competition, Miami's Guitar Ensemble Festival, and the Miami Classical Guitar Orchestra, as well as directed two of the most prestigious International Guitar Festivals in the country through the Guitar Foundation of America in 1991 and 2002. A strong advocate for music and guitar education, MCGS actively works with school music programs yearly, visiting young musicians and highlighting student guitar ensembles and performers as part of our series. Through our yearly cultural programming including world-class concerts, master classes, lectures, lecture-recitals, guitar courses, ensembles, and international competitions, MCGS founder Carlos Molina is a tireless promoter of the instrument, dedicated to offering guitar lovers, performers, teachers, and students the opportunity to enjoy wonderful performances and further develop their talents. We look forward in continuing with our cultural endeavor to share and foster the love for this beautiful instrument within our community and beyond. Join us! © All Materials Copyright Miami Classical Guitar Society 1987-present. All Rights Reserved. Miami Classical Guitar Society is a Florida 501(c)(3) non-profit cultural organization. Brought to you with the generous support from our wonderful Sponsors: Miami-Dade County Department of Cultural Affairs and the Cultural Affairs Council, Miami-Dade County Mayor and the Board of County Commissioners, Savarez Strings, The D'Addario Music Foundation, Anita and Morris BROAD FOUNDATION, MAD Design Studios, Societa Dante Alighieri, Country Inns and Suites, Vitalini Corazzini PA, Harvey & Margie Willensky. In Collaboration With: Guitar Foundation of America, USA; Ciudad De Coria International Guitar Festival, Spain. 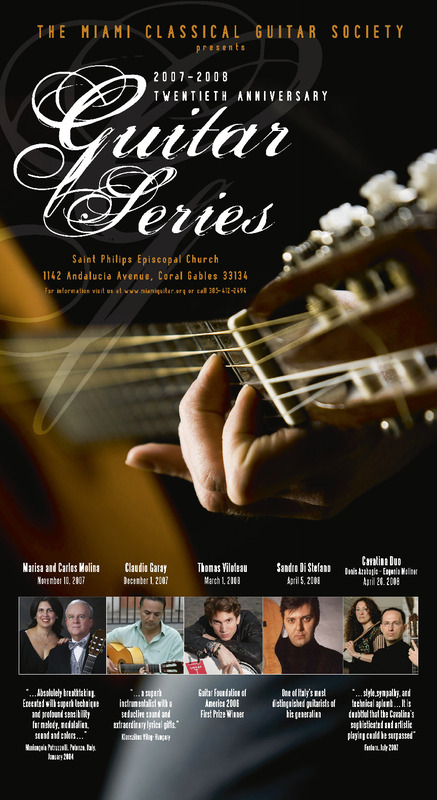 Saturday, November 10th, 2007 at 8:00 pm with Marisa and Carlos Molina, soprano and guitar duo, at Saint Philips Episcopal Church of Coral Gables. This unique presentation will highlight music from Maestros from Latin America, including works by Guido Santorsola, Heitor Villa-Lobos, Manuel M. Ponce, Laurindo Almeida, Luis Bonfa, Sindo Garay, and Ernesto Lecuona. Marisa and Carlos Molina have been performing as a duo in some of the most renowned guitar festivals in Europe for the past years. They just returned from Italy after a very successful tour, where Carlos Molina was awarded the Premio Chitarristico Citta di Fiuggi for his lifetime work as a guitarist. For additional information please call 305-412-2494 or email info@miamiguitar.org.